In early March 2009 it was my pleasure to spend a few days in California at the San Diego Bird Festival. On my first morning in San Diego I headed straight out to the Tijuana River National Estuarine Research Reserve hoping to spend a few hours studying Savannah Sparrows (who wouldn’t, right?). I had seen some Belding’s Savannah Sparrows in March 2008 in Orange County, California, and realized that the treatment of this endangered subspecies in my field guide was not very good, so I was anxious to learn more. I succeeded in seeing dozens of the resident Belding’s, with many birds singing and territorial around the marsh. 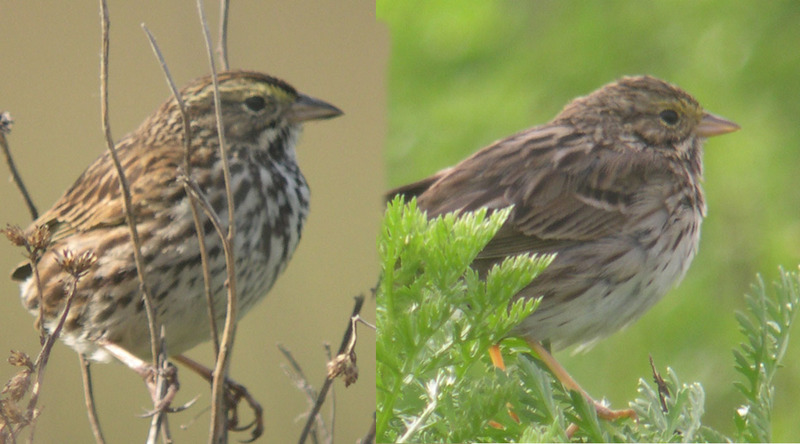 I also saw quite a few of the migratory northern subspecies of Savannah Sparrows (ranging from grayish to brownish) in weedy areas around the margins of the marsh. Belding’s (left) and Northern-type Savannah Sparrows. Photos 5 and 8 March 2009, San Diego, CA; copyright David Sibley (digiscoped with Nikon Coolpix 4300 handheld to Swarovski telescope). Differences in behavior, habitat, and molt were also fairly obvious, and should be very helpful for identification (but bill and plumage features should be checked to confirm). I could not hear any difference in the song of Belding’s compared to Savannah Sparrows from farther north. I was struck by how much stockier and larger-billed the Belding’s looked in comparison to the northern subspecies, in many ways intermediate between northern and “Large-billed” Savannah Sparrows. Apparently some populations intermediate between Belding’s and northern birds are resident farther north along the California coast, but alongside the migratory northern subspecies the Belding’s Savannah Sparrows in southern California seem quite distinctive. Thanks, David; great stuff about great birds! I will be doing a Grand California birding trip in August of 2010 (this year) and, as one who enjoys subspecies, plan to stop by Tijuana River N.E. and see the Belding’s. Thanks for this great article. It helped more more than Rising’s book on understanding the differences. Love the blog and the books. birds (never at the same time) that seem to come and feed with the love birds. At first I thought they might be their babies, but they are not. they look like Savannah sparrows. Is this possible? ifnot what do you think they are?